You won't be able to stop yourself from smiling every time you lay eyes on the imaginative quilted projects within this Charming Sewing Pattern, Handmade Pin Cushion and Button Bundle from Jangles. Through an adorable material mix of glazed ceramics, ruffled embellishments, fuzzy felt, and familiar quilting shapes, these one-of-a-kind designs by Jennifer Heymen do an excellent job of providing every quilting or sewing fanatic with a wide variety of trendy nature-inspired quilted accessories. These springtime patterns for quilted bags, pin cushions, and toys are great gifts to give to friends, as well as nifty conversation pieces for your own home. You'll notice the four diverse sewing patterns included in the Jangles bundle have an exceptionally refreshing nature quilt theme. If you want to make a quilted toy for a small child, check out the Okey Dokey Owl pattern instructions to make a happy, big-bellied owl plushy. Perhaps you're interested in making a quilt for a child a bit too old to be playing with toys? In that case, the Okey Dokey Owl and Friends Applique Quilt is the perfect quilt project to brush up on your applique technique and make a cozy blanket. For a cute and useful quilted bag pattern, the Little Ditties sewing tutorial allows you to create four different quilted drawstring bags in the shape of a crab, cupcake, toadstool, or turtle. Whether or not you choose to make all four drawstring bags, these cute quilted totes are perfect for holding small articles like excess beads or thread. Lastly, try your hand at making your own pincushion by checking out the Daisy Pin Cushions sewing instructions included in this fabulous bundle. While the Jangles sewing patterns are truly charming, the largest and most eye-catching quilted product within this bundle is definitely the delicious-looking quilted pin cushion. 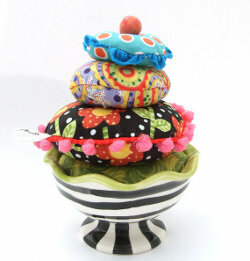 This wonderfully creative idea for a pin cushion incorporates a black and white ceramic saucer with four multi-colored cushions pieced together to look like a slightly melted tower of ice cream. With zany buttons, sky blue ruffles, and fluffy pink embellishments, this Jangles original is a fabulous gift to give to your quilt-obsessed friend. To top off this darling desert quilt, a tiny quilted red cherry sit atop the four "scoops" of ice cream for an adorable final touch. Lastly, this bundle includes four diverse, yet equally elegant handmade Jangles buttons. Whether you choose to sew these glossy little accessories onto a garment or a quilted tote bag, these beautiful ceramic buttons will add a lovely personal touch wherever they are placed. You will be enchanted and inspired by the Charming Pincushion, Sewing Patterns, and Handmade Buttons Bundle from Jangle.